Need a gourmet pick me-up? Our range of gourmet soup flavours make for a deliciously uplifting snack. 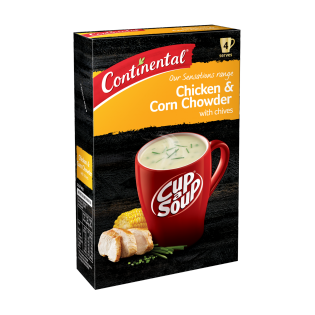 Try Continental Sensations Chicken and Corn Chowder with Chives! Starch (potato, maize), thickener (1412) (contains wheat), vegetable powders (corn˄ (14%), onion, potato), creamer [vegetable oil (contains soybean derivative), glucose syrup, milk protein, mineral salts (339, 450)], sugar, natural flavours (contain milk), mineral salts (451, 452, 508), maltodextrin, cream, salt, chicken (2%), yeast extract, skim milk, glucose syrup, herbs (chives, thyme), garlic powder, spices (white pepper, celery seed, bay leaves), food acid (lactic). ^From responsibly grown corn. Contains naturally occurring glutamates. Saw this recipe and thought Not leeks, but what a surprise a full bodied chowder with tender chicken and potato. This recipe is definitely a keeper. Just plain WOW! !